The Colorado River is one of the most significant major rivers in the Southwest U.S. The Colorado runs 1,450 miles through seven U.S. states and two in Mexico. Between its headwaters in Wyoming and Colorado and its final diversion point at Morelos Dam at the U.S.-Mexico border, the Colorado supplies water to over 40 million people in both countries. Numerous transbasin diversions pump water outside of the natural river basin to supply cities like Denver, Albuquerque, Salt Lake City, and Los Angeles. The river once connected with the Sea of Cortez, creating a vast river delta, but due to the demands of its users no longer meets the sea. While the Colorado is a regional river, its impact is national. The Colorado irrigates agricultural lands that produce 15% of U.S. produce and over 80% of our winter vegetables—meaning wherever we live, we eat from the Colorado River. But increasingly we are taxing the capacity of the Colorado to provide for the land and its people. 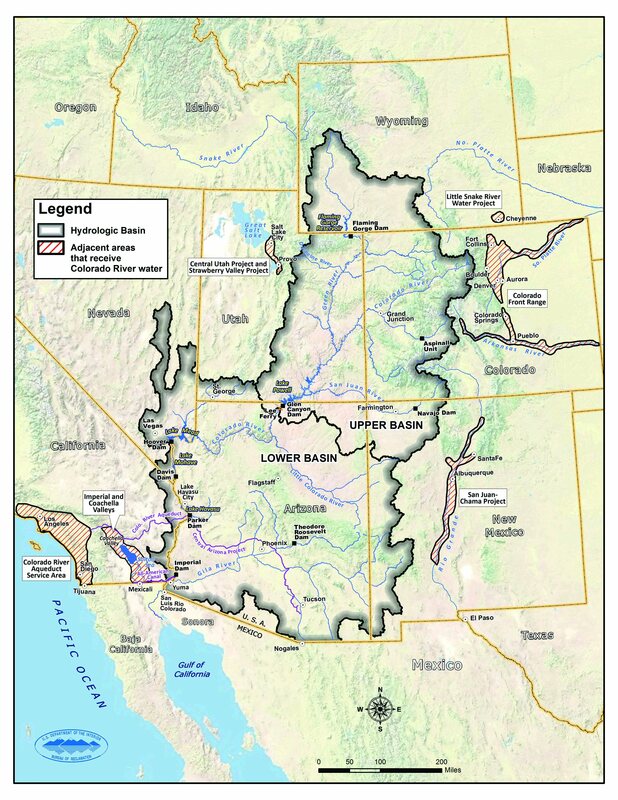 The Bureau of Reclamation estimates a significant deficit in water supply and demand in the Colorado River Basin by 2060 due to drought, climate change, and development. Some believe the deficit will be addressed by removing water from agriculture, a trend already too common in this region. But NYFC believes there’s a better way forward. In addition to a water supply-demand gap, there is also a farmer gap: two-thirds of the nation’s working lands will need a new farmer in the next 15 years. Without reducing the barriers preventing the next generation from accessing affordable, irrigated farmland, we risk losing these lands and the water that feeds them. 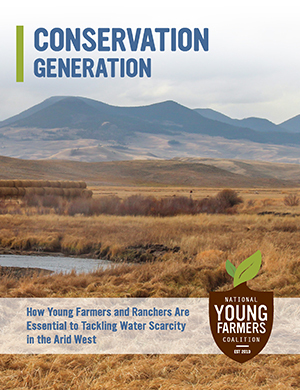 In 2016, NYFC published a report titled Conservation Generation: How Young Farmers And Ranchers Are Essential to Tackling Water Scarcity in the Arid West. The report found that water supply and/or access was the chief agricultural concern cited by respondents, and that conservation is critical to addressing these concerns. Getting more young farmers on the land and in roles of water leadership is key to creatively addressing water scarcity, protecting water for agriculture, and building resilience for a more uncertain future. Young farmers need a seat at the table. NYFC’s Colorado River Basin Campaign strives to achieve these goals while ensuring healthy rivers, businesses, and communities. Efforts are underway to shape the next farm bill, which expires in September 2018. 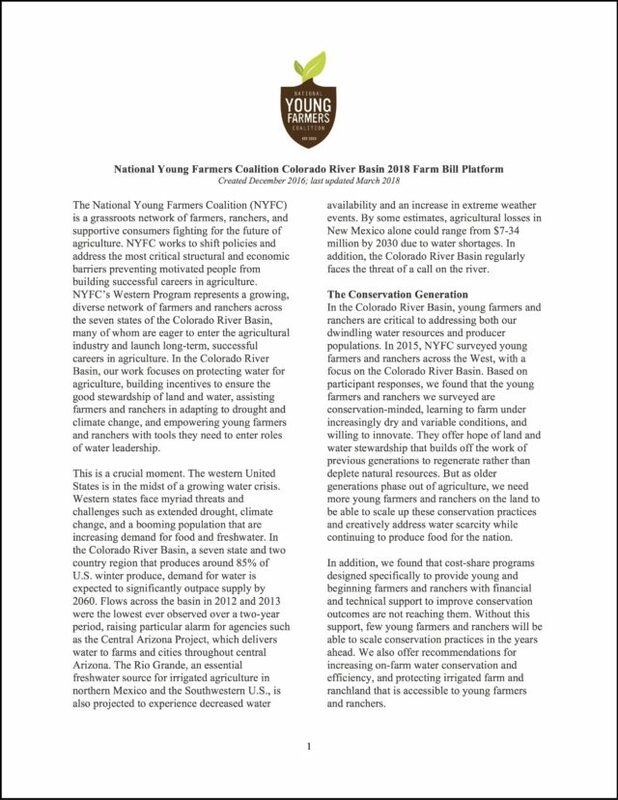 NYFC will be working with Congress to ensure that the farm bill continues to play a critical role in promoting water conservation and efficiency, farm viability, climate resilience, farmland protection, and providing assistance to young and beginning farmers and ranchers struggling with water resource challenges. Read our policy platform.